Flights of narrowing, creaking steps lead to a small office on the top floor of the Georgian-style building. Chatter from the shop at Penn’s Place below dies down, and the heaviness of the old structure settles in. 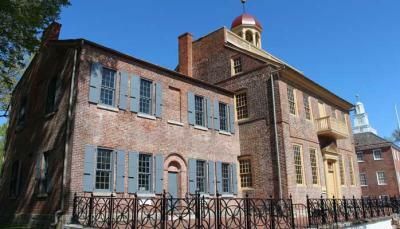 Some 300-plus years ago, this building is allegedly where William Penn spent his first night in America. Over the centuries, it also served as a quiet, private residence, in between the assumed bar-brawling it witnessed as a tavern for a while, before embracing respectability as a bed and breakfast. At this stage in the building’s story, it’s Penn’s Place, home to Traders Cove Coffee Shop, the Artisan Shops & Gallery, and outside space and small venue, The Muse. Angled to get a full view of the town square below, Penn’s Place owner Esther Lovlie sits at her office desk, overlooking the town like a guardian balancing the scales between stagnant and fluid, old and new. She nods toward the window at the New Castle Court House Museum below, which is part of the new First State National Historical Park and ushers in thousands of tourists a year. Today, a few locals are walking dogs on a cloudy afternoon. Flashback to a random year in history, say, 1845, and it’s where abolitionist Thomas Garrett – who helped 2,700 escaped slaves in his lifetime through the Underground Railroad – was stripped of his wealth for his deeds. He gave a passionate Court Room speech about how he’d do it all over again in the name of equality. The town is full of such monumental moments, and it’s people like Esther, a resident and former president of the New Castle Community Partnership, who understand the importance of the town’s past – and future. When I duck out of Penn’s Place, promising to stop back for tea, I head across the street to the Court House. A cheerful young guide Nicole greets me, and 30 minutes of non-stop history starts. “You have just stepped into a 1732 English courtroom,” she begins brightly. 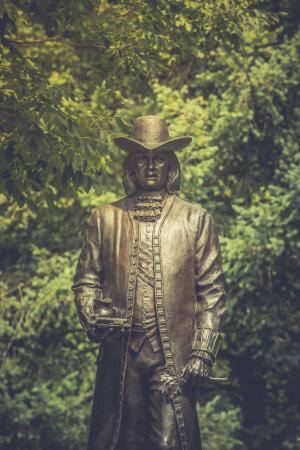 By order of Penn – who was the one to partition area land into New Castle, Kent and Sussex counties – in 1689 the Court House was erected. In 1729, it burned down. “And it wasn’t by accident,” Nicole says wryly. A prisoner awaiting execution for theft managed to escape and set the second floor ablaze, burning the building to the ground. Re-arrested, his second trial had to be held at a tavern across from the Court House where the M&T Bank is today. He was executed (“it was kind of like your public entertainment of the time” says Nicole). A few decades later, talk of revolution was brewing. 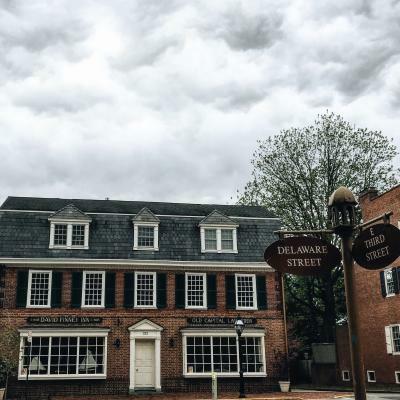 On June 15, 1776, area leaders met at the Court House and declared independence from the Penn family and England, establishing Delaware as a state. Just a few weeks later, New Castle delegates Thomas McKean, George Read, and Cesar Rodney raced on horseback to Philadelphia to sign the Declaration of Independence. Over time, once the courts were moved to Wilmington in 1881, the building transitioned into a police station, mayor’s office, gymnasium, a restaurant, and most notably an elegant tearoom, where stars like Katharine Hepburn and Shirley Temple would stop while waiting for the ferry to usher them across to New Jersey. Once the Delaware Memorial Bridge was built in 1951, the establishment was shut down and the historical restoration began. After the tour, I head outside. Charming Georgian-style row houses and Federal-style homes are punctuated by simple 17th century-style colonial structures and 20th century Victorian mansions, stretching like jagged lines throughout time in a game of connect-the-dots. Expansive gardens are held back by black wrought-iron fences; fountains gush within pristine lawns. Children are playing in the park, and a vendor sells hot dogs and chips from a cart. On my way to meet up with Dan Citron of the New Castle Historical Society, I glance at the Court House’s sprawling Green. A couple centuries ago, a woman named Clara was publicly executed – hung over a pit of fire, to be specific – for murdering her husband. “Supposedly her ghost roams the Green, and you can hear her say ‘I’m innocent,’” Esther said earlier, indulgently noting that Penn’s Place has “its own little ghosties” from time to time, though she’s never seen one. I find Dan at the Arsenal/Visitors Center on Market Street, and we head to the oldest-documented house in town, the Dutch House. A squat brick home, it’s dwarfed by the surrounding Georgian structures. As many of the stories go, the home began in the 1600s as something very different than it is now; it was a one-room log cabin crafted from a meld of Dutch and English styles. The house is indicative of how the average person lived, Dan says. To catch a glimpse into the picturesque lives of the colonial one-percenters, we stop at the imposing Amstel House, too. 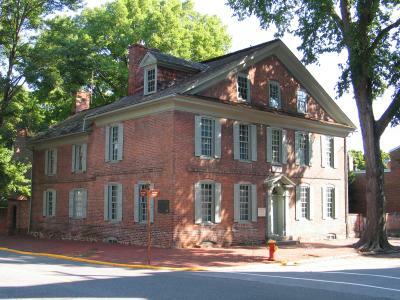 The first mansion in Delaware, it’s known as the place George Washington visited for a wedding in 1784. Dan shows me exactly where Washington stood, which was allegedly directly to the right of the fireplace. This home has its own ghost, too. She’s the “Lady in Blue.” Dan says that one day, an excited pedestrian was sure he saw her drifting inside past a window. Turns out, it was only Dan, wearing a blue shirt. One woman, at a table in a corner, greets everyone who enters – by name. “Hey, Charlie,” she says when the door creaks open. Another lady is busy knitting nearby, agitated fingers flying, until a third woman flings the café door open. “Hey, Debbie,” the corner-lady says, but the newcomer brushes by her and starts gossiping loudly with the knitter. The door opens and closes a couple times. 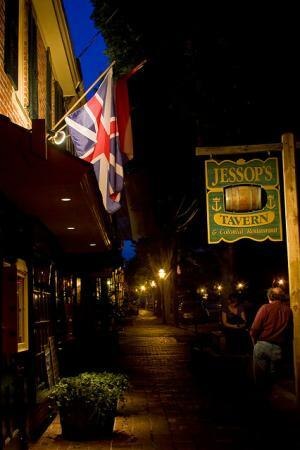 I grin and walk out into the drizzly evening to Jessop’s Tavern, where servers scuttle around in colonial-era garb. A cozy, rugged candle is lit at each table, and the plates are made of pewter. Like every other building in town, the tavern was first this, and then that, and will probably eventually become something else. But sitting in that packed room full of jolly locals and out-of-towners, I’m strangely comforted in knowing that we are all part of the fluidity, while the buildings keep watch, bearing the timeworn weight of it all. Presented by the Community of the City of New Castle, “Taverns, Taprooms and Tippling Houses” will be the theme of the 92-annual event. 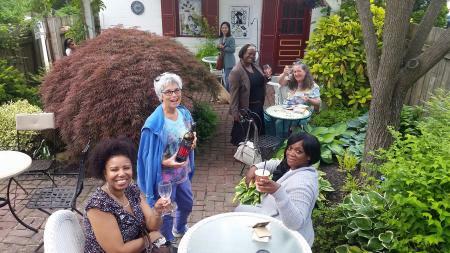 In addition to tours of New Castle’s historic homes and gardens, guests will rediscover the long-lost taverns of New Castle, and become acquainted with the establishments that continue to carry on the tradition of hospitality in the town – along with learning about the art and history of brewing. The day includes civilian and military encampments, musical performances, a beer garden, tastings and more. sepdayde.com Historic New Castle is celebrating 240 years of independence from Pennsylvania and the British crown with a parade, pageant, arts and crafts, vendors and more. Penn’s Place, 206 Delaware St.
pennsplace.net Events feature special menus, with items by Kiki’s Vintage Recipes and Desserts by Dana, table service, craft beer and local wine selections, and of course, live performances. Krista Connor is a 2012 graduate of the University of Delaware and is currently associate editor for Out & About Magazine. You can read more by Krista Connor at WWW.OUTANDABOUTNOW.COM.